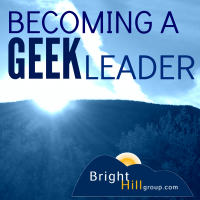 I’m introducing you to the Becoming a Geek Leader podcast. I’m sharing with you what I’m learning about leading geeks, and being a geek who leads geeks. I’m also offering a sample of what you can expect from future episodes. Becoming a Geek Leader, Episode Zero. This episode of Becoming a Geek Leader is sponsored by the Geek to Great 101 course. We all want to grow our skills and improve the work we do, but who has time for that? In this online blended learning program, you and your team will gain practical skills in topics like time management, dealing with difficult people, improving communication, and so much more. Train your whole team for less than $500. Each lesson is 30 minutes or less, so it fits right into your current team meeting schedule. Find more information and get immediate access to your first free lesson at http://BrightHillGroup.com/HelpingGeeks so you can get access to the Geek to Great 101 course. Introduction – What is The “Becoming a Geek Leader” Podcast all about? [00:01:03] Welcome to the Becoming a Geek Leader podcast. My name is Tom Cooper. As a geek, I’m on a mission to figure out better ways to lead others at work and at home. Through the Becoming a Geek Leader podcast, I’m sharing what I’m learning, so I can help make you more effective at leading people too. Ready? Tom: [00:01:24] Hi, my name is Tom Cooper, and this is the Becoming a Geek Leader podcast. As we get started on this podcast, this is Episode Zero, and I want to talk about why this podcast exists. I want to thank you for joining me. Let me start out by saying the plan for this podcast is all about you. Let me play out a scenario here and ask you, “Does this sound familiar at all?” You’re an experienced, highly technical expert. You’re smart. You’ve had really good career success up to this point. In fact, you’re moving up. But all of a sudden, you’re finding out out that work is more and more frustrating. You just can’t seem to make the progress you used to make. In fact, a lot of your time is spent in meetings. In fact, there’s very little time to do any real work because you spend your entire day in meeting after meeting after meeting and collecting a whole bunch of to-dos. And you’re accountable for getting a bunch of work done. [00:02:18] Worse than that, you’re not only accountable for personally getting work done, but you’ve got to get work done through other people. Now, you’re accountable to deliver that, and some of those people report to you, most of them don’t. And most of these other people have other bosses and all of them have other projects. They have lots of projects. Sometimes, they do great work for you, and sometimes they don’t. If that sounds familiar to you at all, then this podcast is designed just for you. [00:02:49] But how did this happen? How did you get here? Well, if your story’s anything like mine, maybe it went something like this. First couple of years after I got out of school, I was seen as the technical guy, that I had all the technical skills. And the geekier I got, the more I got paid. Then at the end of my first year, the more I had learned about the technology I worked on, the more I was rewarded. And that happened again the second year, and the third, and the fourth. And then about the fifth year of my career, it all changed. My boss came to me, and he said, “Tom, you’ve been doing a great job, and I really appreciate the work you’re doing. What I need you to do is show some of these young folks how to do the things that you do. Help them to figure out how to do it better.” Now, here’s a challenge. Up to this point, we’ve had a deal. The deal has been I get geekier, and you pay me more. You can’t go changing the rules now. That’s not fair. And that was a big frustration for me, was figuring that out. But the thing that I’d had to learn was that it wasn’t ever about me being geeky. That wasn’t it at all. It was always about the business problem, and my boss had hired me to solve business problems. Now, he hired me to solve them using technology, but he doesn’t really care what technology is used. [00:04:12] And here’s where you are now. You’re at a point where you have to adjust your thinking. So early in your career, it was all about your brains using technology X to solve a problem. Now, it’s still about your brains, and it’s still about your problem-solving ability. That’s the same. What’s different is two things. First, you have to recognize that you’re no longer in the technology business. You’re in the business problem business, and you solve the business problems using technology. See? That’s how business people think, and it’s how you have to start thinking. And number two, you’re no longer personally going to do the technical work. You’re going to use your brain, and you’re going to the be the conductor of the orchestra of team members and technology that’s going to solve those problems. [00:05:01] Now, I work with clients all the time, and they struggle with this. In this podcast, I’m going to talk about how you can think more like a business person. And when you do that, you’re going to get more support and resources for your projects, and you’re going to be able to grow your career. So you’re going to be thinking differently because you’re in the business problem business, not in the technology business. You use technology, but it’s not about the tech. And the second is you are the person who coordinates, organizes, and leads others to deliver work. [00:05:29] In this podcast, you’re going to get bite-sized ideas and practical application points. I’m going to give you the tools you need to be successful. Let me tell you a little bit more about my story. Once upon a time, there was a young software geek, and every day, he worked on software projects. Day after day, he watched as these technology projects struggled. Some of them worked, but many of them, too many of them, failed. He got frustrated. And one day, he discovered project management, and that helped. As he got certified as a project manager and began to study project management principles, he found more success in his projects. But eventually he saw technology projects that didn’t work. They were run by certified project managers, and they were using methodologies and tools that were provided by the PMO, and it still didn’t work. [00:06:20] And he thought, “There’s got to be a better way.” Until one day, quite by accident, he discovered that you could learn to lead other people, that leadership was not something that you received at birth or just a natural gift that you had, but that it was a set of tools, a set of skills you could learn. And so he had become a leader of a team, and he thought, “Well, how can I work on learning more how to use these skills?” And so he began to experiment on his team. And you know what he discovered? He discovered that his projects got healthier, that his team worked better together. When his bosses saw those things, they gave him more work, more projects. The team delivered higher quality work, and life was good. And then he thought, “I’ve become a better boss, and I’d like to have a better boss.” Wouldn’t it be great if it was that easy, just say, “Hey, I’d like to have a better boss,”? The challenge is, the boss factory has a quality control problem. Sometimes, the bosses that get turned out are fantastic, and other times, well, not so much. [00:07:28] But as he grew in his career and as he learned more about how to be an effective boss and he started looking for a better boss, he realized that nobody was helping people figure this stuff out. That they were proficient technically, they got promoted, and they were put in a position where their boss said, “Well, you go figure that stuff out. You’re smart.” And so he decided to start a business. And what I do now, because I’m that formerly young software geek, is I help geeks communicate, moving from being that hands-on technologist to the one who leads a team of people who are able to deliver great technical solutions. [00:08:05] And the four areas that I work on are: I help leaders and teams communicate clearly, delegate more effectively, manage conflict in a productive way, and plan. So thinking about communication, how many times have you had to spend a whole lot of time playing cleanup because you had a miscommunication in an email or in a meeting? Think about delegating. Sometimes we delegate, and it doesn’t work. They don’t get the work done, or if they do, it’s bad quality. We have to do it ourselves. And so we say, “Why am I bothering?” Managing conflict in a productive way. Conflict can be very healthy, but most of the time, we struggle with it. And we end up saying, “Well, we can’t have Person A and Person B work together because they don’t get along.” And finally, planning and executing well. We are so busy. We’re too busy to plan. And I’ll talk about ways to plan better without having to invest a huge amount of time. I’m going to giving you real-world examples that will help you turn your ideas into action. [00:09:00] So let me take a minute and share with you, what can you expect? In Season One, I’m going to be talking a lot about the core things you need to know about how to be geek leader. What do you have to do to effectively lead other folks? I’m going to put out episodes about every two weeks. There are going to be 10 episodes in the first season. During each episode, I’m going to be sharing stories about my clients. I’ve got a big family…I’ve got seven children…and I’ll be sharing some stories about my family as well, leadership lessons I’ve learned in that regard. One key thing that I’m going to be giving you every single time is what I call an “episode hack.” It’s an action item, one key thing that you can apply after each episode. [00:09:43] One thing I want you to know is you’re not alone. For most of us, our boss came to us and said, “Hey, look. You smart. You figure it out. Here’s a couple of people I want you to oversee. You go figure out how to make that work.” But what we’re doing here is we’re learning together how to more effectively motivate, communicate, influence those people around us to deliver great solutions. And I’m excited you’re here, and together, we’re going to learn a lot about how to become geek leaders. What can I learn from the podcast? [00:10:12] Each episode of the podcast is made up of different segments that focus on different ideas. Let’s take just a minute and give you an example of what you can expect. In the Mentoring segment, Tom tackles tough issues, based on his years of experience. In the Coaches Mailbox segment, Tom answers a direct question from a listener. Want Tom to answer your question? Just send an email to Coach@BrightHillGroup.com. In the Tech segment, Tom talks about tools, processes, and theory related to Agile, projects, systems, and more. In the Thought Leader segment, Tom brings in ideas from today’s best thought leaders. In the Family segment, Tom shares leadership lessons from his family life. In the Episode Hack segment, Tom shares one action-oriented takeaway from this episode, something you can apply right away. Here’s a quick clip from Episode One. Do you know your boss’ spouse’s name? How much do you know about your boss’ spouse? That’s the person they partnered with. That’s the person they spend a bunch of time with outside work. It’d be a good idea for you to know who they are. Now, I’m going to ask you a really tough one. Do you know how many kids they have? Let me just submit to you that if you don’t even know the names of the people that this person considers the most important people in the world, how do you think you’re going to have any influence with them at all? Here’s another snippet from Episode Two. So Cecilia, if you’re focusing on the needs of the CEO, how can you translate the key elements of your message to match up with the needs of the other person? If you can tailor your message to meet the specific needs of the other person, it’s going to help you dramatically. The fact of the matter is that the most precious resource that’s available to anybody in a leadership position is their time and attention, and they’re not going to invest the time. What they’re counting on you to do is to roll that data up, do some analysis, give them information that is recommending a course of action. Help them understand exactly what it is that the data shows, not every little piece of data. And there, you’ll have the opportunity to sign up. As you register on the community, you’re going to get access to transcripts of the broadcasts. You’re going to get access to the show notes, and to other pieces of valuable content that are going to make your experience with this even better. So head on over to BrightHillGroup.com/GeekLeader, and be sure you sign up. Thanks for listening to this episode of Becoming a Geek Leader. You can play a part in helping the podcast to grow. If you enjoyed it, please do me a favor. The way to get the podcast to grow is for you to go to iTunes and give it a rating. If enough of you give me a good rating at iTunes, this podcast will show up in the “New and Noteworthy” section. Being in “New and Noteworthy” is a great way to attract more listeners, and having more listeners helps me have the support to keep the podcast going. There are three simple steps to giving me a rating: one, go to the iTunes store in the podcast section, two, search for Becoming a Geek Leader, and three, give the podcast a great rating. And while you’re there, why not write a quick review, as well? Thanks. This is Tom Cooper. Thanks for listening. Be sure to join me next time for another episode of Becoming a Geek Leader. Join me in my mission of discovering better ways to lead others at work and at home.